A little girl likes being her Daddy’s princess as he swings her through the air. But she really doesn’t think she could be a princess all of the time. You see, a crown is hard to wear and she’d have to sit on a throne a lot. Not very exciting for a little girl. Her Mommy reassures the little girl that “what will be will be.” The little girl dreams of being an astronaut flying to different planets, or a doctor to heal her dog’s sore tummy, or a teacher to make the class be quiet and respectful, or a baker to bake the best cakes and cookies. The list of possibilities is endless. And playing dress-up to pretend each possibility is half the fun. Her Mommy keeps reassuring her that “what will be will be” and the little girl continues to dream of what she might be. That is, until Daddy comes home from work and once again she’s Daddy’s little princess. 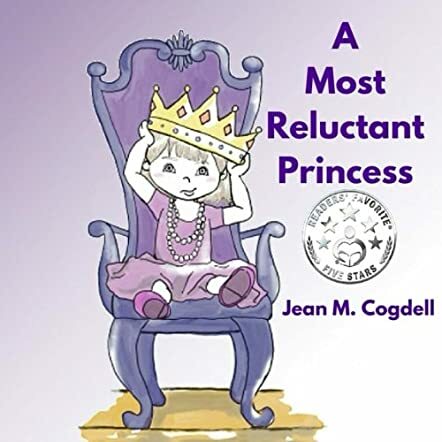 Jean M Cogdell’s rhyming picture book story, A Most Reluctant Princess, is both sweet and endearing. It gently tells young readers that they can be anything that they want to be, but at the same time they will always be treasured by their parents. After all, that’s what the little girl’s Daddy is telling her when he calls her his princess: he’s telling her that he treasures her. And that’s an important message for young children: being treasured and being allowed to follow their own dreams. Children and parents will certainly enjoy this book.